The quote above belongs to the earliest known wing-suit designer and pilot, Daedalus of Crete. His dream of flying in the sky that is open to all and ruled by none inspired generations of would-be aviators across the world seeking the thrill of human flight. The invention of the airplane did not appease many who wished to fulfill the original dream of flying with wings as a bird. Thus began the renaissance of wing-suits in the mid 20th century. The past few decades have seen amazing developments in wing-suits shapes and performance, and today footage of wing-suit “flocks” and rocket-propelled “birdmen” are becoming increasingly common. Sadly, over the years careless design has led many of these pilots to suffer the fate of Icarus. Though today a dozen or so commercial organizations sell various wing-suits to the growing community (numbering a few hundred worldwide), it seems that none have taken the time or effort to conduct scientific research of their products’ capabilities. This is where we come in. In this study we have developed the basis for rational design of a wing-suit. We present theoretical models for the aerodynamic characteristics of a wing-suit: performance, stability, forces transferred to the limbs, etc. These models have been verified by an extensive wind-tunnel testing. We present semi-empirical models for pilot characteristics: maximal forces that can be endured by the limbs, center of gravity position and moments of inertia. These models have been verified experimentally in the gym. 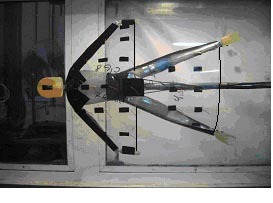 We present a six-degrees-of-freedom simulation that allows testing a suit for its handling qualities. We have used this basis to design an “optimal” wing-suit – a well-performing suit, which has acceptable handling qualities and exerts tolerable loads on the limbs. Comparing simulated performance of our design with the flight test results of the best existing wing-suits, our design seems to have better flight range and endurance. However, based on our analysis, it is possible that in these flight tests the wing suits were not flown at their optimal performance. Correct body positioning could have allowed better performance in existing suits.